As you already know by now, there are numerous hair supplements out there and the numbers keep growing. In this review, we cover everything you need to know about Toji hair supplements, how it can help with your hair loss, and how long it takes to see results. As far as we know, the company has been around for at least several years, purely focused on providing products for promoting healthy hair growth. What they are known for is Toji Pure Density vitamin supplements, their main product. Now, they have extended their product lines to include hair oil treatment, shampoo and conditioner (see the full product line here). In this review, we focus on their supplement. All of their products are made in the USA and manufactured at a cGMP-compliant facility with an A rating from two different authorities. When it comes to finding the best hair vitamins and supplements, it all comes down to one thing: Ingredients. In other words, pretty packaging doesn’t mean much (even though it doesn’t hurt), if the ingredients are not legitimate. If you want to get hair growth results, you need the right ingredients. 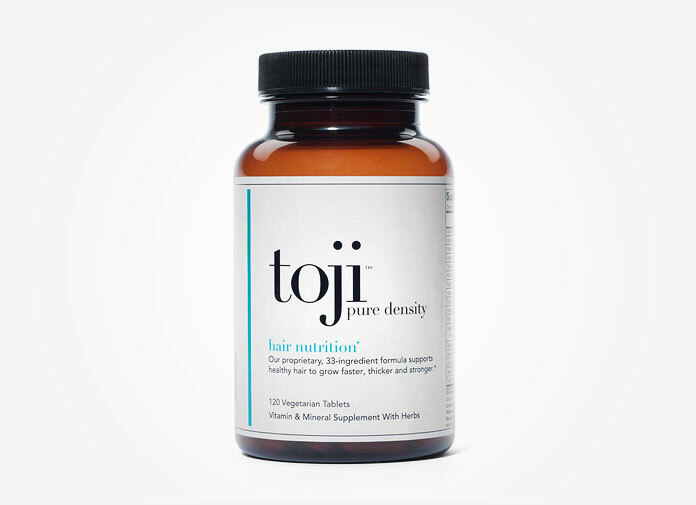 Toji pure density vitamin clearly states the supplement is formulated with “33 proprietary ingredients” designed to promote healthy hair growth that is also thicker and stronger. First, let’s take a closer look at the list of ingredients. At first look, we see a BUNCH of familiar ingredients from the label that have been on many research studies in relation to hair growth. Some of them include saw palmetto extract, horsetail extract, nettle, MSM, and eclipta alba, just to name a few. Let’s cover some ingredients in detail on how each one helps with hair loss. This herb is known as a natural alternative to minoxidil. According to the Journal of Ethnopharmacology, eclipta alba applied on mice showed almost TWICE FASTER hair growth compared to the mice with minoxidil (control group). The researchers also noted eclipa alba’s natural ability of turning hair follicles from telogen to anagen phases (aka, terminal to growth phase) as well as increasing the number of hair follicles and skin thickness. 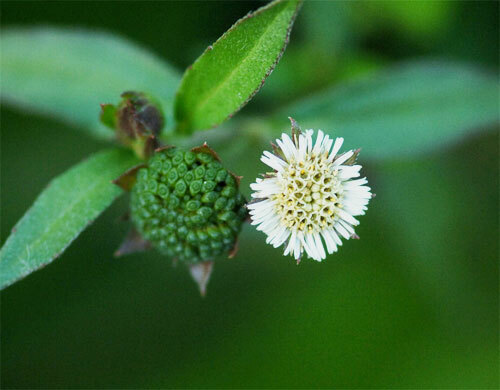 Eclipta Alba, also known as Bhringraj has been used for Ayuverdic treatment to treat hair loss and promote hair growth. Finally, the company claims that Toji pure density is THE only known major hair product that includes Eclipta Alba. So that’s a BIG plus. MSM is known for its ability to promote healthy hair growth and nails. Its major compound is sulfur, which is used for building collagen synthesis. In turn, collagen plays an important role of keeping our connective tissues, cartilage, bones, and skin and hair in good and vital shape. A study conducted by Yeungname University in Korea shows positive results of the role of MSM on hair growth. The researchers evaluated the role of MSM for promoting hair growth when combined with MAP (magnesium ascorbyl phosphate – a form of vitamin C used for skin and hair vitality). The result showed that the mice group with MSM + MAP had significant amount of hair growth (200-fold increase for MSM 10%), compared to Minoxidil or MAP alone groups. Both horsetail and bamboo extracts include something called Silica. Numerous people swear by Silica supplements in their improved hair conditions. Silica has many roles in our body: aiding a hormone balance between magnesium and calcium, participating in the development of every part of our body, creating collagen for connective tissue which includes our skin and hair, and finally restoring vitality to our hair by stimulating well-balanced blood circulation to your scalp, essential for healthy hair growth. Saw palmetto, by far, is one of the most used ingredients for any hair supplements. There are endless discussions on saw palmetto in relation to hair growth on Internet. It is believed that Saw Palmetto acts as a natural DHT-inhibitor by decreasing as much as 32% DHT activities which is the most common reason for hair loss in both men and women. Need we say more? Biotin is hair vitamin 101. The deficiency is directly linked to alopecia. Dr Oz also mentioned at least several times on his show about the importance of taking Biotin for healthy hair growth along with fish oil. We recently featured a hair loss success story about a man who witnessed unexpected hair growth WITHIN 3 WEEKS. What did he do? He took grape seed extract powder for blood pressure, then had a happy side effect – New hair growth. You can read more details on how grape seed extract can help with stimulating hair growth. Gingko biloba is another popular natural ingredient people use for hair loss. How does it help with hair growth? Gingko is believed to be a natural blood-vessel widener, thus encouraging proper nutritional supply to your hair follicles. Other hair growth ingredients that are not mentioned above, but surely important parts of Toji vitamins are: stinging nettle extract, Gotu Kola extract, iodine from kelp as well as vitamin B6 and B12. 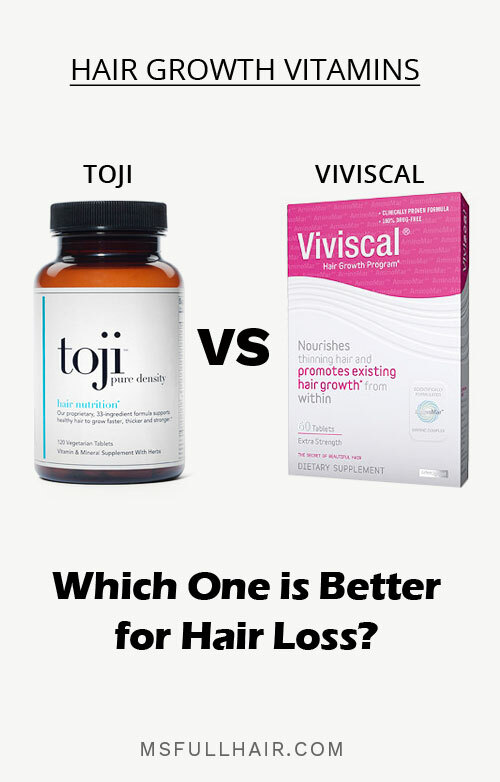 Toji vs Viviscal – Which one is better for hair growth? As a starter, both hair supplements include the same following ingredients: Biotin, Vitamin C, Niacin, Zinc, Horsetail Extract. For Toji purity vitamin, their ingredients are more focused on a variety of natural herbs and plants known for preventing hair loss and stimulating hair growth, with some of them definitely backed by research studies. For Viviscal, what makes it special is their trademarked ingredient called “AminoMar Marine Complex” which has over 50% of content in each Viviscal tablet. AminoMar is the key ingredient of Viviscal supplements and is the main driver of stimulating hair growth. Viviscal has been around for years and also performed a number of independent studies to prove the efficacy of their hair supplements. Also, it has been featured on numerous magazines as the ultimate hair loss solution. On the other hand, Toji is a rather new kid on the block, so there is less publicity on them. However, what’s great about Toji supplements is that the company has continuously grown and their supplement offers a great complex of hair-growth-promoting ingredients by using natural solutions. There are a number of before and after photos from people taking Toji pure density supplements (see photos). One of the most impressive is from a review currently selected as the “top customer review” on Amazon right now. The woman’s review includes before and after comparison photos side by side. You can clearly see new hairs were filling in on the side edges. She adds “it has only been 10 days” when she took the “after” photo. As of right now, Toji pure density has just over 500 reviews with 4.5 stars at the moment. In order to give you the most comprehensive and un-biased reviews on Toji purity vitamin, we went through hundreds of “verified purchase” reviews… reading both positive and negative, and noting what’s commonly discussed. Baby hairs filling in: as little as 10 days to 5-6 months, quite a number of people report new hair growth on thinning spots and on the edges. Professional customer service: the company backs up their products by offering money-back guarantees for up to 3 bottles. People also said the customer service was friendly and professional. Also note that we double-checked customer profiles giving 5 star reviews to see if they are fake or not. What we listed above appear to be genuine reviews. The smell and the taste: The most talked-about negative point among reviews is the smell and the taste is awful. Many people mention the tablets leaving an after taste. Possible stomach ache or headache: We also read some 1 star reviews claiming that the supplement created stomach issues or headaches. It only happens in a few cases, but it should be mentioned. Also as a side note, make sure to take vitamins with food. Taking vitamins on empty stomach is not advised. Possible fake reviews: As most of you know, fake reviews were a serious issue on Amazon (Amazon should already be on top of this… or at least trying to be). There were some 5 star reviews (luckily not a lot), that seem suspicious. When we clicked the profile for those reviews, we noticed some of them only had 1 raving review in total. How long to see result? In general, any hair vitamin or supplement takes about 3 months to see the results. 3 month is considered to be a general time-frame for your body to adjust and respond. The company states a minimum of 6 months for best results, which is also a common recommendation given by many supplement companies. However, we read some people saw result as early as 10 days by noticing less hair falling or baby hair coming in. But in most reviews, it appears that majority of people consistently take the supplements at least 1 months to see hair growth results. Where can I buy Toji vitamins? Amazon and Toji’s site seem to be the only places that are carrying Toji pure density supplements as of right now. If you want to try every possible natural ingredient discussed on Internet as hair growth stimulants and try ALL OF THEM at once, Toji supplement is your answer. Why? With the huge list of both powerful and popular herb-blends such as saw palmetto, horsetail extract, ginko biloba, nettle and grape seed extract, you are getting all of the ingredients designed for stimulating hair growth, conveniently in one bottle. 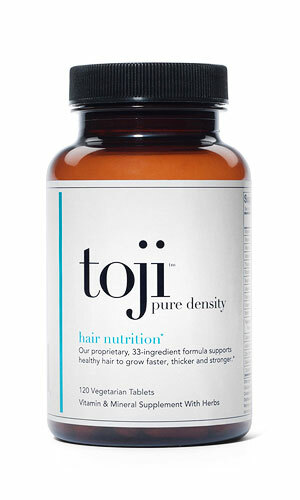 Have you tried Toji Pure Density supplement? Share your experience below.